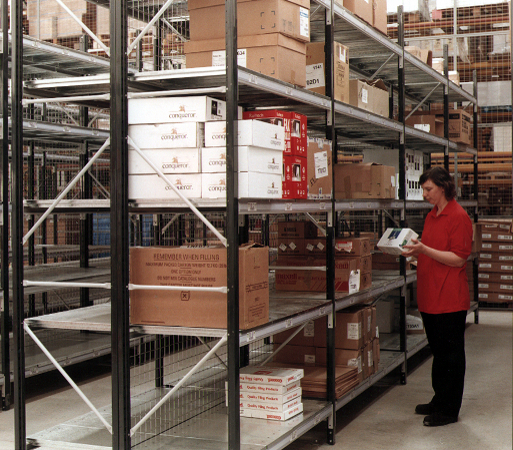 For non-palletized storage requirements, or heavy archiving and office storage; across the UK, Acorn Storage Equipment offers a wide range of commercial shelving systems, including longspan shelving, mobile systems and general office shelving. Offered supply only, or tied in with mezzanine and pallet racking installation projects, our extensive range of shelving offers solutions for everything from timber yards to smart offices. Sourced from the very best manufacturers in Europe, we also often have shelving equipment available on a used equipment basis. Heavy duty wide bay steel shelving for hand loaded storage of everything from stock to archives; offering a wide choice in frames, beams and shelving we can supply a system with the ideal load bearing capacity. Straight forward office shelving systems with endless adaptability thanks to a huge choice in frames and sizes, great for general office storage, filing systems, archiving, retail storage, workshops and stockrooms. A great way to get the most out of your available space, mobile shelving moves on rails so that you can easily stack them together, opening up an access point whenever and wherever you need it. Mobile shelving easily doubles your storage space. Modular and bespoke systems are available and can be installed into any typical sized office. Euro shelving is a highly versatile, modular shelving system with heavy-duty capability for when longspan shelving is just a little too big, but anything else is not big enough. Euro shelving is ideally used in stock rooms, retail storage, document archiving and parts storage. Get any kind of system you need at Acorn Storage Equipment in Kent. Contact us today to arrange a quotation with one of our team and work out exactly which storage shelving will be ideal for your requirements.